Douglas von Blumenthal, a radiologist who listens to VoiceBox, my weekly public radio and podcast series about the human voice, was inspired to share his interesting ideas about simultaneous opera translation having recently listened to a show I aired on the subject of translating operas into English. 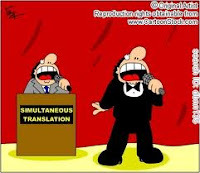 In an ideal world, a translation system for the audience would be optional for each person, unobtrusive, low cost, simple to use, would not distract the audience or performer, and would not require the user to shift focus from the performer to written text. These requirements reminded me of a system used at my favorite art museum, The Norton Simon, located in Pasadena, California. For a small fee, visitors can rent a recorded audio "tour" discussing works of art as they move through the collections at their own pace, listening by means of a lightweight head set. Newscasters on TV wear an earpiece on one side which is quite small and hardly visible, through which they can be given verbal information, cues, etc. Wireless Bluetooth "earpieces" for handsfree use of cell phones have been around for a while. These and commonly seen devices such as iPod earphones allow the wearers to carry on a conversation and hear ambient sounds with little distortion or interference while they listen privately, and are not loud enough to disturb or distract people quite near to them. Although I am a radiologist and not an audio engineer or electronic communication expert, it seems to me that the technology may already exist in one form or another to give a member of an opera audience the benefit of "on-the-fly" translation. This would be analogous to the UN official listening in real time to an expert near-verbatim translation of a speech being given in another language. Transmitted information may not be limited to lyrics and dialogue. For example, a couple weeks ago you broadcast a show featuring a very skilled and experienced "professional translator" of opera scores as your guest. He pointed out that the best translations preserve the cadence and flow of the original language, combined with the very difficult communication of idiomatic speech. He demonstrated this by a soft voice-over in English while we listened to singing in the language native to the opera. The effect was stunningly beautiful and poetic, immediately opening up a whole world of information allowing neophyte listeners like me a much richer opera experience. This would only be enhanced by very brief plot summaries or commentaries which could theoretically be interwoven with the translation. I believe that through the earpiece the listener would be able to maintain almost total focus and concentration on what prompted the ticket purchase in the first place. As word spread, in an ideal world opera attendance would increase, attracting new people who were interested but heretofore intimidated. In short, development of a technological audio real-time translation system would yield a great deal on more than one level. NB To listen to a podcast version of VoiceBox show mentioned in Dr. von Blumenthal's text, please click here.